Prior to the widespread production of videos, audio interviews were a popular way for the Smith community to hear directly from alumnae on a wide variety of topics. Click on the archived items below for lively and inspiring interviews. The following alumnae interviews were conducted by Karen Brown, radio documentary producer, freelance writer and longtime reporter for WFCR public radio, in Amherst, MA. Brown’s features have appeared on National Public Radio and other national outlets. She has also written for The Washington Post, The San Francisco Chronicle and other publications. 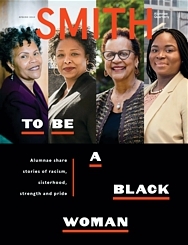 She has been contributing to the Smith Alumnae Quarterly since 2001 and conducted the “Author’s Voice” interviews. She lives in Northampton, Mass. with her family. This two-day conference provided a historical overview of the written word and look ahead to what might be in store. With other alumnae and Smith faculty, the conference covered the influence of women as writers and explored some of the contemporary issues in journalism and literature. Anne Leone: Backyards and Across the Tracks: Why Should We Love the Vernacular Garden?